The parish was established in 2000 and ground was broken for the present church in 2006. It's a large stone building with Byzantine influences evident in its style. Behind the altar is a colonnaded reredos that shelters a domed tabernacle. To the left is the baptismal font, backed by a painting of the baptism of Jesus. To the right is a statue of the Blessed Mother holding in her lap the boy Jesus, who holds a chalice and communion wafer in one hand. They appear to be a very active parish, sponsoring adult spirituality groups, a charismatic prayer group, Bible study, Knights of Columbus, a Mothers' Guild, men's fellowship, Legion of Mary, and many services and outreaches too numerous to mention but well described on their website. Once each month they put on a program called Come and See, for parishioners enquiring about parish activities and for non-parishioners (Catholic as well as non-Catholic) wishing to learn more about the faith. There are four Sunday masses including one in the evening, as well the Saturday vigil mass and one weekday mass. The city of Surprise, the northwestern-most suburb of Phoenix, still includes many large tracts of undeveloped land but is undergoing rapid development now that the economy has come out of the doldrums of 2008. 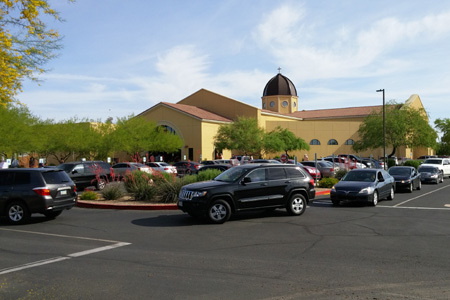 The church is located on Bell Road west of the partial ring road known as the Loop 303 (partial because it is actually about one-quarter of a ring, connecting Interstate 10 in the southwestern suburbs with Interstate 17 in the northern suburbs). There are some new middle-class housing communities and shopping centers nearby, as well as a Baptist and Missouri Synod Lutheran church. Also nearby is an upscale retirement trailer park known as the Happy Trails Adult RV Resort, whose sign I thought at first glance read Happy Trails Adultery Resort. The Revd Hans P. Ruygt, pastor, was the celebrant. He was assisted by a deacon whose name was not given - the directory lists four deacons, so take your pick. There were also a crucifer and two acolytes. Bernadette Wagner, director of sacred music and liturgy, conducted a choir of 17 men and women. They say the building can hold 2000. It was completely full, with standees in the back. Everyone was smartly dressed, but the days of the Easter Parade are long gone, I'm afraid. Metal chairs with cushions - comfortable enough. However, there were no kneelers. I arrived a half hour early, and people were literally streaming in from the parking lot. The church was already quite full. There was a mild buzz of conversation. "Good morning, everybody. Happy Easter." Grand piano for the one choir anthem, electronic organ for everything else. I found it interesting that their website includes downloads of the choir parts for the coming Sunday's musical selections. A woman sitting two seats to my right swigged from a plastic water bottle. She, her daughter, and her husband (sitting next to me) whispered incessantly throughout the entire service. Very nicely celebrated Catholic mass. The priest and deacon were vested in white chasuble and dalmatic, respectively. The crucifer and acolytes wore albs and cinctures and had chosen appropriate footwear (with one exception - see below). Quite a bit of chanting. The deacon chanted the Victimae paschali laudes in English. During the renewal of baptismal vows, a cantor chanted the Vidi aquam, first in Latin and then in English, as the priest and deacon sprinkled the congregation. Bells at the consecration but no incense. The hymns were all traditional - none of that Singing Nun nonsense here! 7 – The pastor spoke from notes but looked up from them to the greatest extent. He spoke clearly and included a very gentle and subtle dig at those people who show up for church only on the big holidays. But they say every good sermon has at least three exit points, and the preacher should always take the first. The pastor's sermon illustrated that truth very well. It was so wonderful to hear real music in a Catholic church, especially the chanting. And not only did we sing all verses of every hymn, but the congregation even remained in place until the last verse of the recessional hymn had concluded. Not a single one walked out early! That's the first time I've ever witnessed that happen in a Catholic church. As the priest sprinkled the altar party after the renewal of baptismal vows, the crucifer flinched noticeably when the holy water hit him. The unpardonable sin of having chosen to wear sneakers under his alb, when everyone else was wearing black dress shoes, must have weighed heavily on his soul. People cleared out pretty fast, with several scouting about for photo opportunities (little boy kneeling in prayer before the altar, family selfie in front of the baptismal font, etc.). I snapped several photos myself, and congratulated the choir director on the excellent music. None today, but I understand they do have coffee and donuts after mass on normal Sundays. Out in the parking lot, I heard an electronic carillon playing some well-known hymns. It didn't sound like it was coming from St Clare's, so I thought it might be the nearby Baptist church. But then, when it struck up "Hail Holy Queen Enthroned Above," I thought, uh-uh, not the Baptists! Are Missouri Synod Lutherans into Marian hymns? 7 – If only I could subscribe to all the teachings of the Catholic Church, which I can't. Not only do they take their liturgy and preaching seriously here, but their music as well - all of which I look for in a church. And they seem to be a very active parish with a lot going on. However, I might be one of those people whom the pastor gently chided for showing up only on special occasions. I'll certainly be back to hear the choir. Yes. I'm very glad I chose St Clare of Assisi this morning.